One of the best things about living in the Mid-Western United States is that we (sometimes) get all the seasons, but my heart always yearns for more spring after the long, dark, cold winter. Eyelets nestled in cables, reminding me of springs earliest leaves and flowers peeking out from under winter’s last bits of snow. 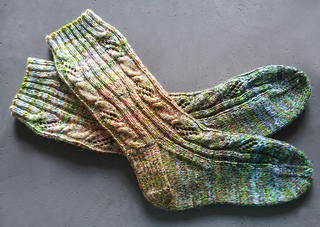 These cuff down socks feature an integrated lace and cable pattern along with some ribbing to make them just as cozy as you would like on a cool spring morning. A rounded toe and heel flap round out the pattern making them perfect for switching between boots and shoes, as we all know that spring can be a little unpredictable. 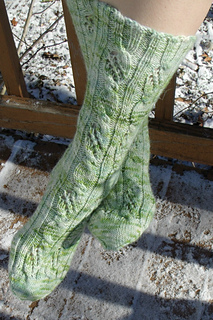 This pattern includes written instructions for the sock shaping with the pattern stitches in charted form only.